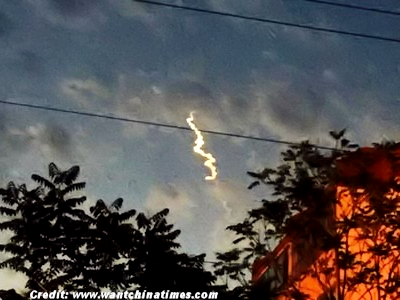 On May 23, internet users from different parts of northwestern China including Ningxia, Shaanxi and Inner Mongolia said they witnessed an unidentified flying object in the sky, with many suspecting it to be a new spacecraft or missile, reports state-run Global Times. The event took place the night of May 23. Photos uploaded on various Chinese websites showed a light beam flying in the dark sky. One military expert said that the light beam was more likely created by a humans and not a natural occurrence. The viewers said that the craft looked 10 kilometers from the ground when those photos were taken. Many netizens believe the light beam they saw was either a new type of spacecraft or ballistic missile being tested by the Chinese government. . . .